Endeavour space shuttle commander Mark Kelly (left) and Mission Specialist Mike Fincke aboard space shuttle Endeavour talk to students at Mesa Verde Elementary School in Tucson, Ariz., on May 22, 2011. The elementary school classmates of a young girl killed in the January shootings in Tucson spoke with astronauts aboard NASA's space shuttle Endeavour late Sunday to get a glimpse of what life in space is like. 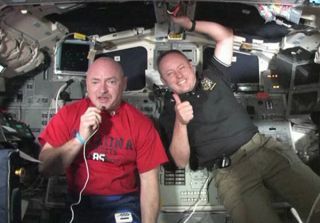 About 400 students from Mesa Verde Elementary School in Tucson, Ariz., stayed up late Sunday night (May 22) for the chance to talk to Endeavour shuttle commander Mark Kelly and mission specialist Mike Fincke as the astronauts sailed 216 miles (347 km) above Earth. The cosmic call was organized by NASA for Kelly, the husband of Arizona Congresswoman Gabrielle Giffords, who was wounded in the Jan. 8 attack that killed six people. Among those killed was 9-year-old Christina Taylor-Green, a student at Mesa Verde. "In the last four months, I've come to admire your classmate Christina Green very much," Kelly told the students. "I've come to learn a lot about her, and when I was her age I remember watching the Apollo astronauts walking on the moon." Kelly said he was inspired by the Apollo moon landings and hoped to help spur interest in space among the students as well. Kelly said he has fond feelings for Arizona, and not only because his wife is from the state. Giffords was shot in the head during the Jan. 8 attack and underwent surgery last week, while Kelly was in space, to have a portion of her skull replaced with a plastic plug. Giffords also watched Kelly launch into space aboard Endeavour on May 16. Kelly is also wearing a blue rubber bracelet embossed with the words "Peace, Love, Gabby" in his wife's honor. This still from NASA TV shows some of the 400 schoolchildren at Mesa Verde Elementary School in Tucson, Ariz., as they cheer when speaking with Endeavour shuttle astronauts on May 22, 2011 during an event. Do they have a doctor onboard for emergencies? No, but the crew is trained for some instances and can call for help if it's needed, the astronauts said. How do astronauts brush their teeth in space? The same way people do on Earth, but with no running water, Fincke said. Incidentally, "brushing teeth is important for you guys as well, not just astronauts in space," Fincke told the students. Have the astronauts ever seen anything strange in space? "I don't think anyone has ever seen a UFO or an alien, but we're keeping our eyes open," Fincke said. Endeavour shuttle commander and veteran astronaut Mark kelly displays the 2010-2011 yearbook of Mesa Verde Elementary School in Tucson, Ariz., which he carried to space with him on Endeavour's final spaceflight in May 2011. This still was taken from a May 22 broadcast. Kelly, Fincke and the rest of Endeavour's crew are in the midst of a 16-day mission to the International Space Station, where the shuttle is currently parked. The shuttle launched into space on May 16 to deliver a $2 billion astrophysics experiment and other spare parts and supplies to the orbiting lab. Two of four scheduled spacewalks have been performed. Later today, the astronauts will take some time off to rest from their busy spaceflight and speak with Italian President Giorgio Napolitano. There are two Italian astronauts in orbit together on this flight, one on Endeavour and the other on the space station. The crew will also be at the space station during an unprecedented event: the departure of a Russian Soyuz spacecraft returning three station crewmembers back to Earth. A Soyuz has never departed the International Space Station while a NASA shuttle was docked at the orbiting laboratory. Astronauts aboard the Soyuz plan to snap photographs of Endeavour docked at the space station as the capsule departs to capture the unique photo opportunity. This mission, called STS-134, is Endeavour's 25th and final spaceflight before the orbiter is retired later this year along with the rest of NASA's shuttle fleet.